Based in Baldwin, WI, Northern Metal Fab, Inc. (NMF) is a manufacturer of sheet metal, heavy plate steel, stainless steel, aluminum parts, weldments, and assemblies. NMF is certified to manufacture and repair pressure vessels in accordance with the requirements of the ASME Boiler and Pressure Vessel Code and the National Board of Boiler and Pressure Vessel Inspectors. For over 30 years NMF has provided its customers with quality fabrication services. Our long history, deep capabilities, and exposure to a wide variety of industries provide insights into our customer's designs. Whether you need to produce a first of its kind prototype, require long production runs, or more large scale parts and weldments, NMF has the scale, capacity, and expertise to bring your designs to life. Forming, Rolling, Saw Cutting, and more. NMF has two plants in Baldwin, WI with a combined production area of over 140,000 square feet, 20,000 square feet of cold storage space, and over 7 acres of paved exterior storage space. We have 19 overhead cranes ranging in capacity from 5 to 20 tons, and max fork lift capacity of 27 tons. NMF has some of the most advanced fabrication machinery available, and a sizable labor pool with deep expertise across a large cross section of manufacturing requirements. NMF utilizes a team approach to take our customers through the manufacturing process. Our engineers work closely with our skilled machine operators, welders, and painters to ensure quality products that meet our customer's requirements. Our team goes beyond simple application of conventional industry best practices. We work with our customers to find the best manufacturing solutions to achieve a high-quality product with great value. From product development and prototypes, to design reviews for iterative improvements to existing designs, NMF is here to help our customers resolve complex manufacturing challenges. NMF has the machines and expertise to laser cut, plasma cut, saw, form, and roll your desired parts out of aluminum, stainless steel, or mild steel. From large lots of laser cut parts, to lower volume orders of heavy parts as large as 12' wide and 46' long, NMF has you covered. See our Machine Portfolio for specific machine capacities and general part tolerances. Our assembly and AWS certified welding staff have over 75,000 square feet of production space available over five main bays. Our welding team is experienced in Wire Feed, TIG, and Submerged Arc welding. 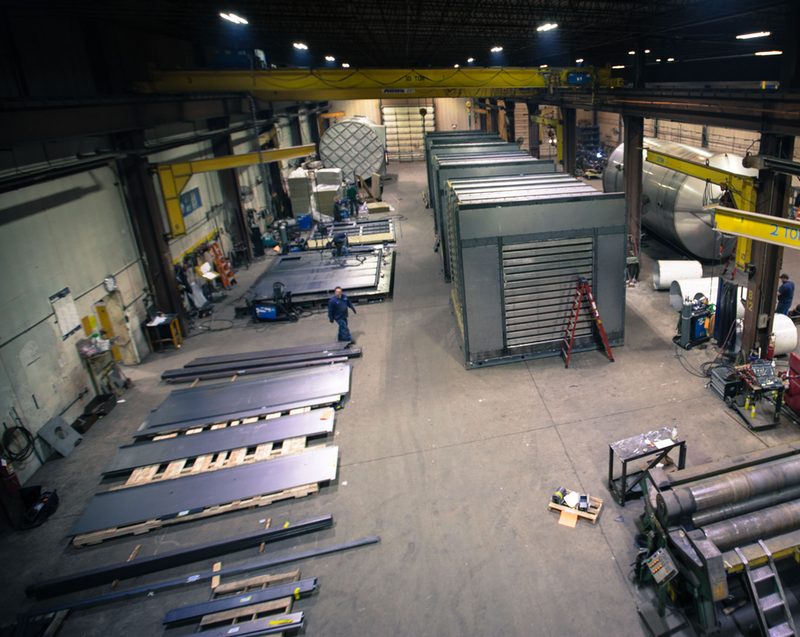 Stainless, Aluminum, Carbon Steel-- whatever your material requirements are, our crew is ready to meet your needs. NMF has a strong background in plumbing installation, mechanical assembly, and is capable of coordinating electrical assembly to help our customers circumvent expensive assembly labor in the field, or the the added cost of working with and shipping to specialized assembly shops. Whether you need partially pre-assembled components to prep for final assembly during installation, or you need a fully realized turnkey product shipped directly to your end customer, NMF is ready to help our clients develop a terrific value conscious solution. NMF has on-site shot blasting and wet coat painting facilities. Our blast booth is 20'Wx60'Lx20'H and accomodates both steel shot and glass bead from two exterior pots. Our two paint booths are 14'Wx26'Lx14'H and 20'Wx60'Lx20'H. Both possess dual exhaust stacks with inlet dust filters and paint collectors. We have also furnished them with direct fired makeup furnaces to accelerate the painting process. NMF manages many projects that require a powder coated finish, and have developed a robust supply chain of vendor partners. Are you seeking a special stainless or aluminum finish? NMF has multiple surface treatment and polishing options. NMF doesn't consider a project complete until it has arrived on-site, ready to be installed, and consider this critical element at the point of project inception. We maintain a healthy stable of brokers and freight vendors that are familiar with the size and scale of the projects we do, and we work with our customer's vendors to ensure successful logistics coordination. From preparing for oversize loads, containerization plans for international shipments, to working with our customers to design custom pallets, crates, and cribbing, NMF is dedicated to ensuring your product arrives on-time and intact.